The Keen Kind is spending August focused on the little things. While brainstorming topics for this month I felt the need to create an exercise that forces readers (and myself) to tap into the small moments in our lives. Inspired by a podcast I heard years ago, I realized the best method for recognizing small moments was a thankfulness, or gratitude, challenge. In this podcast, the hosts' reported on a study in which a group of people were asked to write a daily log of what they are thankful for. I believe most of their documenting was done first thing in the morning, possibly through the act of morning pages, or perhaps as a simple bedside list. Nonetheless, by the end of the study people were found to have better attitudes and such and such positive results. Honestly, the results are not the most important part of this story. What people wrote in their journals is what peaked my interest. The study showed that participants listed their family, friends, and significant others as objects of their gratitude. Rarely, if ever, did a participant say they were thankful for everyday privileges such as access to healthcare, clean water, electricity, a roof over their head, and more. I was not surprised by the results. However, I was jarred by the scientists’ assessment. I knew that, if I had been involved in this study, I would have listed the same answers as the participants. It never crossed my mind to include institutions I viewed as inalienable rights and unmoving structures. I spent so much time focused on the parts of my country that need work—from reproductive rights to police brutality to the prison system—that my yearning for improvements eclipsed my own institutional privileges. I thought I was woke before, yet suddenly my eyes were opened wider. Though I cannot remember what podcast I tuned into (and please, if you know it or the study, tell me in the comments below), the recording has stuck with me. Since that first listen, my sense of thankfulness has shifted. Now, when I utilize a gratitude journal or a list, healthcare (despite it’s expenses and issues), education (no matter how much my higher ed cost), clean water (in my state, at least), and the like, make my list. Though I do not live in the “perfect" country I wish for, I have access and rights to things that are not sacrosanct globally. 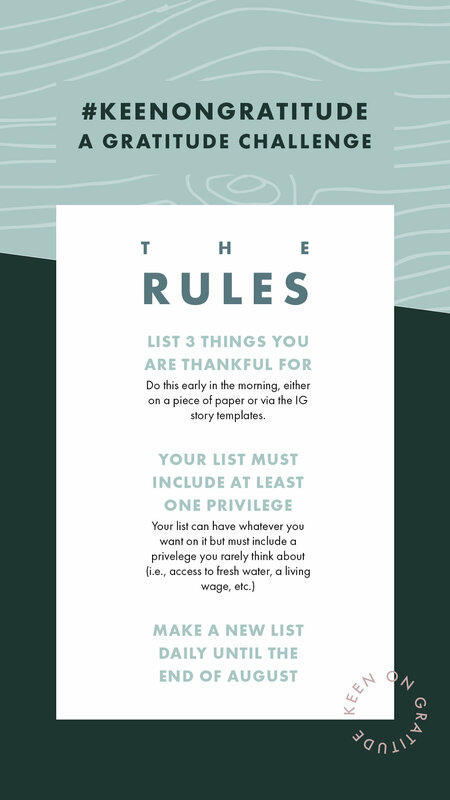 The brainstorming, the podcast, the idea of privilege and acknowledging the little things in life, all led me to create the #keenongratitude challenge. Yeah, it’s kind of a cheesy name. But it works, it fits the brand, it makes for a nice hashtag…just go with it, y’all. The #keenongratitude challenge is a simple exercise in which you document what you are grateful for on a daily basis—essentially, gratitude journaling. 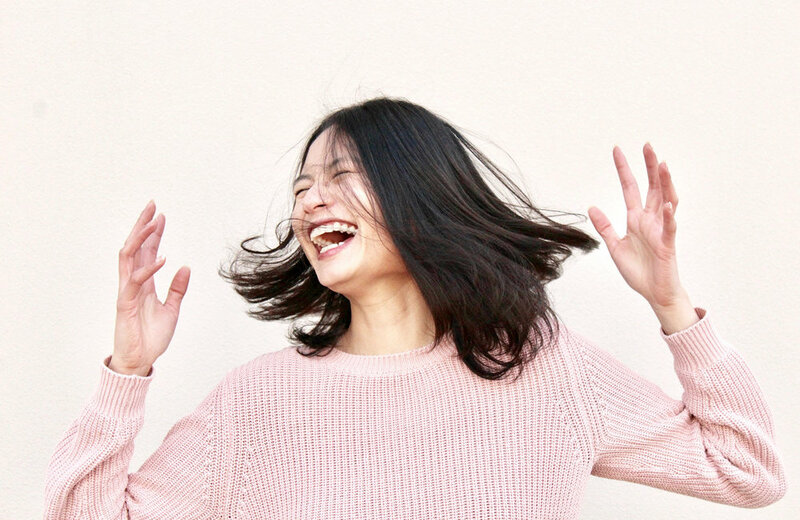 Not only will you learn something about yourself by journaling your thanks, but there is evidence that this type of exercise can lead to improvements in psychological health, a better sense of empathy, lower stress levels, and more. Not to mention, the health benefits you earn from journaling in general. So many perks, right? And I have made it easy for you to participate—you can spell out your thanks in less than three minutes. Here are the rules so you can get started. In the morning, before you kick off your routine, take a few minutes to acknowledge three things that make you happy. You can do this through the Instagram story templates (provided below) or even on a piece of paper. Whatever method you choose, thinking about your list is not enough. You must document it. Your list can have whatever you want on it (whether that be "hot tea" or "familial support") but must include one privilege you rarely think about (such as fresh water or a living wage). To make this challenge as easy as possible, I have created seven instagram story templates on which you can list your 3 pieces of gratitude. When you check Instagram in the morning (no judgement, we all do it), you can take an extra minute to upload a template and fill in your day’s thanks. If you tag the post with #keenongratitude, then you can join a community of others participating in the same challenge. Not only can we hold one another accountable, but your documentations will encourage others to consider their own privileges and happy moments. Click on an image below to download. Though I’ll be sharing my gratitudes on Instagram for the next few weeks (you can follow my progress @thekeenkind on Instagram), you can always share what you’re thankful for in the comments below! Tell me, do you have a different process for acknowledging your thanks? Do you do so through religion? Writing? Talking to others? Let me know.